Before airplanes and automobiles exploded onto the scene, rail travel was virtually the only way to travel cross-country. In some parts of the world, such as Europe and much of Asia, it's still one of the standard modes of city-to-city travel, and in others (e.g. North America) it remains as a fairly popular alternative. It lacks the speed of air travel on longer distances and often the density of coverage of the road network, but compensates with space to move around while someone else does all the driving. It's also more comfortable than air travel, especially in terms of legroom and to those who don't like the thought of being suspended 30,000 feet above the ground. For distances between about 100 and 800 km it may be the fastest method of travel, especially if you need to go from city center to city center. A rough first estimate is that a train is faster than a competing air-service if it takes three and a half to four hours or less, as getting on a train usually doesn't require being at the station more than some fifteen minutes prior to departure. For longer distances it takes longer than travelling by air, but provides you with a ground-level view of the territory you're visiting, and allows you to stop on the way. Prices range from cheaper than even a full car in some countries that highly subsidize public transport to comparable to (or even higher than) cheap airline-tickets in other countries that want their railways to generate revenue or have privatized them. In some cases both at the same time, depending on the level of service and the time you book. Be aware that it can be very expensive in some countries to travel by train. Especially high speed trains can be as expensive as — but more convenient than — flying. When comparing prices read the fine print carefully, as both trains and no-frills airlines sometimes charge (unreasonably high amounts) for things such as seat-reservations, baggage, boarding passes or certain forms of payment. Generally speaking trains are cheaper the shorter the distance and while planes show a similar dynamic it is much less pronounced and longer airfares are (usually) cheaper per kilometer than shorter airfares. If you can, book in advance. In many countries you benefit from a substantial discount, and on popular routes at certain times longer-distance trains can be fully booked. Reserving a seat, on the other hand, will usually incur a small surcharge — in these countries, you will have to decide whether or not the train will be empty enough for seats to be readily available. Fares might be calculated by distance, speed, type of train or by market demand (with more popular routes and times being more expensive) or of course any combination thereof. Many countries offer passes, allowing several journeys to be made within a region. Inter Rail (for Europeans) and Eurail (for others) are good value for those who qualify and wish to travel extensively through Europe. Otherwise, typically, the value gained from such a ticket is in inverse proportion to the area covered (unless you spend the whole period of the pass on trains). Amtrak and the state of California offer similar deals for non-residents, as do Japan and South Korea. In some countries tickets can be bought on the train, in others they must be bought before boarding to avoid fines. In some countries, both systems exist depending on the type of train. Buying tickets on the train might incur a surcharge, or mean you can't buy a discounted ticket that would have been available from the ticket office. Generally speaking the best that can happen if you buy tickets on the train is that they are as expensive as if you had bought them any other way. If possible, try to avoid business rush hours. For local trains, this typically means travel on trains due to arrive at a reasonably large town or city between (roughly) two hours before and one hour after the traditional start of work, and departing a similar sized town between one hour before and two hours after the traditional end of the workday. On the other hand trains in the rush hours are often more frequent, and if you don't mind standing, you're more likely to have good connections in peak periods. In western countries, Friday evenings, Sunday afternoons and public holidays are also not good choices of time. Be particularly careful when travelling on Sundays and public holidays, as services are often reduced or non-existent. Some lines, especially high speed lines, are frequently used by "weekend commuters" and thus particularly prone to overcrowding on Friday evenings and Sunday evenings but almost empty the rest of the week. Services in the late evening or early morning are often sparse and may not be as safe. That being said, in countries with flexible pricing taking the "red-eye" may save you considerable money, just as it does in aviation. Sometimes there is a limited amount of discount tickets or special discounts apply for certain days, times of the year or hours of the day. If this is the case it is usually wiser to travel at off-peak times, or plan well ahead if you are reasonably flexible. In many countries there will be sleeper services at night. While you will usually pay a premium for the accommodation, you also possibly save on a hotel and "lose" less time in transit even if the total travel-time might sometimes be higher (in some countries sleeper-trains have lower maximum speeds than regular trains). 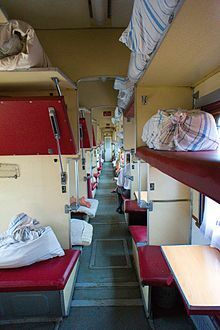 Consider investing in a couchette or sleeper compartment, which are often cost-competitive with lodgings for the night. A couchette cabin has around 6 beds for sleeping and no other facilities, while a full-fledged sleeper will have two to four beds and possibly bathing facilities like a sink or shower. Because of the noise and the shaking of the train, the quality of the sleep may not be as good as in a real bed. Some people, however, sleep better while on a moving train. Having several persons in the same tiny room could make the atmosphere smelly. If no bathing facility is available, you may not feel comfortable the next day of your travel, and it may prevent you from using such a service several days in a row. When arriving at your destination, you may have to find a place where to store your luggage (such as a coin locker) for the day, for example if you plan to visit the city. Your time of departure/arrival may be in the middle of the night or the early morning. This is especially true for connections between second-rate or minor cities that are along a route but not on either terminus. To avoid the need to change trains in the middle of the night, many railroads split up and join trains during the trip, which can mean in the extreme that the 12 car train leaving A has two cars bound for B, three cars bound for C another two heading towards D, four cars with the final destination of E and finally one car that goes to F. If you board that train and are headed towards F, triple check you are in the right compartment, especially if you are unfamiliar with the local script. If required, check that you have validated your ticket. You may have to pay a fine or a supplement on board if you forget it. There are often machines for that on the platform and/or in the train. In some places, fare inspectors are very humorless, have a tendency to rules lawyer and speak little to no English, so your excuse of "it's my first day here" is unlikely to get through or have much effect if it does. Be on time, or early. In many countries, if you have bought the tickets in advance, turning up 10 min before departure is more than enough, but allow more time if the departure station is large and unfamiliar. Longer distance (inter-city) trains often lock the doors 30-60 seconds before departure. Sometimes an earlier arrival is necessary, for example in China where there are security and identity checks before boarding, or for the Channel Tunnel between England and France/Belgium, where border checks are done before boarding. Many trains call for very brief intervals at smaller stations, sometimes as short as 30 seconds. Have all your luggage at hand and be prepared to board quickly. Tuck away loose pieces of luggage like drinks, maps, guidebooks and coats before the train arrives to ensure a smooth boarding procedure. Don't run if you can avoid it. Stand well back from the platform edge when express or through trains pass the station. They can generate a lot of turbulence as they pass. If you have anything with wheels or rollers with you, keep an eye on it, make sure the brakes (if any) are engaged and position it parallel to the tracks. This will minimize the risk of rolling on platforms which slope slightly towards the tracks. A radio controlled watch can be a useful device for frequent rail travellers. Trains in Western nations normally depart pretty much on the second of timetabled time, and "railway time" is synchronized with "atomic clock time", which radio controlled watches use. A normal watch is often wrong by a couple of minutes, which can make a big difference in the world of trains. Knowing in confidence that you still have 120 seconds to get from platform 1 to platform 12 will save you from having to run and experiencing unnecessary stress. Radio controlled watches can be purchased cheaply online. Synchronized mobile phones and PDAs will also do the job. Pay attention to announcements both over loudspeaker and via (electronic) boards if you don't speak the language/ can't read the local alphabet ask railway-staff. Familiarize yourself with the layout of the station. Usually tracks/platforms are continuously numbered starting with one, but there are exceptions and layouts along the lines of track one next to track four and track 360 next to track 361 in a separate building are not entirely unheard of. Sometimes a part of the tracks is subterranean which may or may not be indicated on your ticket. When boarding, stand on either side of the doors when other passengers are alighting. Find out if the class or car you are boarding is in the front, middle or rear of the train and position yourself on the platform accordingly. Ask the staff on the platform. In some countries, stations are divided into zones and diagrams show you what zone your coach number corresponds to; for Japan and China's high-speed trains, even the exact positions of the doors are painted on the platform. Some trains consist of two or more parts going to different destinations or taking different routes. They will usually be separated en route, so make sure you line up for the right part already before boarding. Give way to encumbered passengers, such as people with lots of bags, people with children and people in wheelchairs. Offer them a hand if you can if they're struggling. Many trains, particularly commuter services have some device to see if somebody is still trying to board or alight. Often this comes in the form of a photo sensor in the door, that may be triggered by people standing to close to the door. Get away from the door once you're on board, as you might otherwise trigger the sensor, keeping the doors from shutting and thus holding up the train. Trains offer a wide variation of amenities. Some trains offer airline style entertainment systems, WiFi and power sockets. Others offer very little by way of facilities, some not even offering toilets. Tuck away your luggage as much as you can. Don't let it block the aisle or the seats for other passengers. There may be luggage racks at the ends of carriages for larger items, or overhead space for smaller bags. Most trains in developed countries are fairly safe as far as petty criminal activity is concerned. Elsewhere this might not be the case, and there are always "black sheep". When in doubt, ensure that your luggage is kept in your sight at all times. If you have your own compartment, lock the door from the inside when sleeping, preferably with your own lock. If you are on a peak time train you may find that all the seats (if any) are taken. Do the best you can to find a safe place to stand or squat. Do not occupy the roof, the toilet, the luggage racks or the space under the seats or tables. Many trains have first class accommodation. This can be affordable in some cases, or very expensive in others. You are paying (typically) for a wider seat and a much emptier compartment. The "perks" offered to first class ticket holders are usually fairly minimal (for example, free tea and coffee, better entertainment or newspapers). Do not travel in first class unless you have a ticket or other permission to do so. In some countries (such as Belgium), pregnant women have first class access at no extra cost. If there are reserved seats and you do not have a reservation, look above the seats, as the reservation is usually marked there and take a seat without a reservation. If there is no indication system or the one there is doesn't work, ask staff to help you. In some developing countries people may enter the train for the sole purpose of selling food. It may also be sold through windows or on the platform during a (short) stop. This is usually cheap but at your own risk of travellers' diarrhea. In high income countries these people are usually railway employees or officially licensed, but their selection of food and drinks is usually limited and overpriced. In some trains (usually the "premium" category i.e. high-speed first class) you can get food served at your seat. If it is included in your fare, don't expect too much. Sometimes you will have to pay more than in the dining car. Keep in mind that trains are an extremely safe mode of transportation. The Japanese Shinkansen has not recorded a single fatality in 50 years of operation. The last deadly accident on a German high-speed train was in 1998 and the reason for that accident has been eliminated. Even though it might sound counter-intuitive, high speed trains have a better safety record than "normal" trains. All trains that go above the general speed limit (160 km/h in continental Europe, 79 mph in the USA, 125 mph in Great Britain) are equipped with continuous in-cab signalling, which interacts with the trains systems and automatically applies the brakes if the driver exceeds the speed limit or is at risk of passing a signal at danger. This makes accidents caused by driver error drastically more unlikely. Furthermore, high speed lines are built without level crossings and part of the process of upgrading a "normal" line is removing or drastically reducing the number of level crossings. In some countries high speed lines are even fenced off or elevated, thus almost eliminating the possibility of something or somebody getting on the tracks. That being said, there are some ways to increase your personal safety. All trains have emergency brakes. If you see something that drastically compromises the safety of the train (e.g. a piece of a wheel piercing the floor), don't hesitate to pull it. While pulling it without reason usually incurs a fine, if you can show that you had reason to believe that the train was in danger, you are off the hook. This should go without saying, but: Don't step on the tracks. Especially not if the gates are down. If you have to cross at a level crossing, do so quickly, only when and where allowed, and look both ways before doing so. If something falls onto the tracks or your vehicle get stuck/breaks down on a level crossing, immediately get everyone clear of the tracks. If one is available, use the emergency telephone at the station or crossing to contact the signaller, who will try to stop any approaching trains if they can. Only once the signaller has assured you that all trains have been stopped should you try to remove the item or vehicle. In the unlikely event of an accident, the windows are usually a means of escape. On German ICEs, there is a red dot on the upper part of the window and a small hammer next to it. Hit the dot with the hammer to shatter the window and just push it out. On other trains similar systems exist. If railway staff are available, they should always know how to get out through the window, failing that, the process is usually written out somewhere near the window or in a safety brochure. Automatic doors can usually be disabled and then opened by hand. Again don't do this "just for fun" as you might incur a fine. In the event of an accident, there is usually a lever to pull or a button to push. When exiting the train after a derailment, especially when exiting through the window, there may be a significant drop to the ground. Keep that in mind and look before you jump. If there is fire, even a broken leg or two is better than suffocating in the smoke, though. When you jump from the train, be wary that electrified overhead lines could have fallen on the train. Make sure not to touch both the train and the ground simultaneously as you could earth the wires and receive a 25,000-volt electric shock. The major risk factor for the average passenger, is crime on board, and on the stations. Especially pickpocketing and molestation do occur on crowded trains though usually no more or less than in other crowded situations. Trains travel at widely varying speeds. High-speed trains travel at around 300 km/h on dedicated lines, making rail the fastest travel mode for fairly long distances. They are in fact capable of even higher speeds if infrastructure allows it, but economic concerns usually keep speed at or below 320km/h (200mph). Conventional trains may travel at 150-250km/h in countries with decent infrastructure, or significantly slower in others. The same country may have both modern, fast lines and older, slower lines. The general speed limit for non high speed trains is 79 mph in the US, 160 km/h (99mph) in much of continental Europe and just around 200km/h (for specially equipped track) in Britain. Many countries have medium to high-speed tilting trains (sometimes called Pendolino) that allow for higher speeds on curvy tracks than normal trains. Some travelers get "trainsick" due to the movement of the train. If you fear this might be the case, try using another train. Trains are typically, though not necessarily, faster than buses. When comparing speeds of air-travel to train-travel, keep in mind that getting to/ from the airport also figures into your travel time. In Europe most airports are outside of city-centers (especially those of low-fares airlines with Hahn (HHN IATA) being more 100 km from the city of Frankfurt it claims to be close to) and travel to/from them can take well over an hour in bad circumstances. Keep in mind that security checks and boarding procedures - if they exist at all - usually take longer at airports than for trains. We have more detailed guides on rail travel in these specific countries/regions. Other than that the "by rail" subsections of the get in and get around sections usually provide the information where more detail is not needed. If you know more about rail travel in a specific area, don't hesitate to plunge forward. China, Japan, South Korea and Taiwan all have extensive and well-developed railway networks. Japan's iconic Shinkansen was the world's first ever high speed train, and for a long time was the only such railway line in Asia. However, China, South Korea and Taiwan have since jumped on the bandwagon and now possess modern high-speed rail lines along their main business corridors. In particular, China has invested heavily in quickly building up its railway infrastructure, and now boasts the longest high-speed rail network in the world. While India boasts a long network of regular train lines and some luxury tourist trains, high speed rail has thus far never gotten farther than anouncements and plans. Outside of East Asia, many railways have fallen into disrepair and are merely relics from the pre-WWII colonial era. In many cases, poorly maintained infrastructure means that travelling by bus can be faster than taking the train. Especially in Western and Central Europe, trains are fast, efficient and cost-competitive with air travel. High-speed trains like the French TGV, the German ICE, the Spanish AVE, the Italian Frecciarossa and Italo, and the cross-border Eurostar and Thalys services speed along at up to 320 km/h (200 mph) and, when taking into account travel time to the airport and back (as well as security and tediously long boarding procedures), are often faster than taking the plane. The flip side is that tickets bought on the spot can be expensive, although there are good discounts available if you book in advance or take advantage of various deals. In particular, the Inter Rail (for Europeans) and Eurail (for others) passes offer good value if you plan on traveling extensively around Europe (or even a single region) and want more flexibility than cheap plane tickets or advance purchase train tickets can offer. The most extensive and most reliable train travel planner for all of Europe is the one belonging to the German railways (DB). Keep in mind that you can buy any train ticket from their website - as long as it begins or ends in Germany. Although it once held much of the continent together, and remains useful for local travel in many metro areas, intercity train travel in the U.S. and Canada now ranges from relatively convenient in the Northeast Corridor and Windsor-Quebec City Corridor, to manageable in California, parts of the Midwest and southeastern Canada, to sparse in other parts of the continent. If you prefer to travel by rail, it's still possible (depending on where you go), but it usually offers neither speed nor convenience. Passes allowing several journeys to be made within the same country are available, but cross-border passes have been phased out. Many train stations do not have ticketing agents, or have agents for brief periods at the time the train is scheduled to arrive. At smaller unmanned stations, you may be able to use a ticketing machine, or may be required to purchase your ticket onboard. You may also purchase tickets online or by telephone. Mexico only has two token lines left besides a few suburban train services and metro systems. Plans to build a new high speed rail line were canceled due to the recent drop in oil prices, one of Mexico most important commodities. Trains still serve an important role in some parts of the Caribbean. In addition, tourist and scenic trains can be found on St. Kitts and Jamaica. Almost all trains on the Central American mainland have ceased operations and those that do still exist provide touristic rather than transport benefits to most people. However talks to revive some lines or build new ones have only been cut short by the recent global economic downturn, and this might change again in the future. Rail travel was the dominant form of long distance travel in Australia up to the 1950s. However, the popularity of private car ownership after World War II resulted in the decline of railways and these days, Australia's rail network is only a shadow of its former self. Many lines have since been abandoned, and the only long distance commuter lines remaining are the ones that link the "big four" cities of Sydney, Melbourne, Brisbane and Perth to the nearby country towns. Today, rail travel in Australia is a rather expensive proposition and it isn't all that fast either. This is somewhat less true for the more populous east coast. Most lines were built with freight in mind and passenger service has long been an afterthought. That said, a journey by rail from one end of the continent to the other is one of the last adventures and with comfortable sleeper trains a luxurious one at that. In New Zealand, the rise and fall of rail travel largely parallels that of Australia and today, rail travel is neither common nor fast, with the exception of some commuter lines around Auckland and Wellington, which together have the lion's share of all rail ridership in the country. Nonetheless, a trip on one of the four (yes that's the total number for the whole country) long distance routes offers breathtaking views of the scenery and a way to get around in style road or air transport can't compete with. A few heritage railways also exist and make the journey itself the destination. This travel topic about Tips for rail travel is a usable article. It touches on all the major areas of the topic. An adventurous person could use this article, but please feel free to improve it by editing the page.